Don't be caught cutting into your glorious wedding cake with a boring serving set! Our starfish beach themed set adds that extra special touch that will make the memory even sweeter. 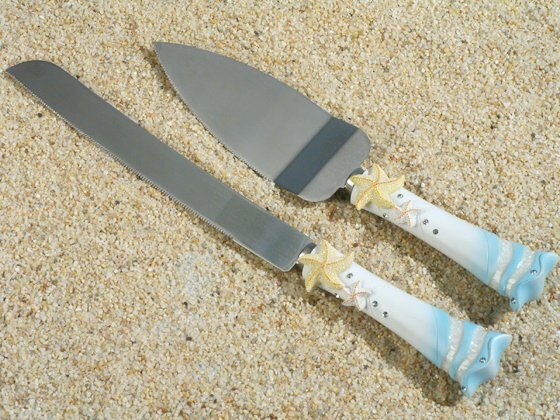 Each cake and knife server set is made of durable poly resin material with embossed starfish designs accented with perfectly placed crystals. The stainless steel on the set will make this memento last. They are individually gift boxed and measure 10" long. Also search our site for the entire Starfish Beach Reception Set - which includes cake servers, toasting flutes, guest book and pen set. How do I add an event date to my order?